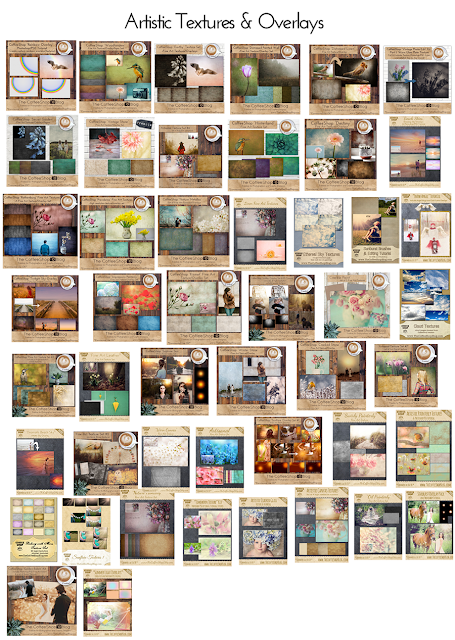 The CoffeeShop Blog: CoffeeShop MegaPack! I hope everyone is having a wonderful weekend! We are hanging out with family and maybe going hiking today, so all is good. 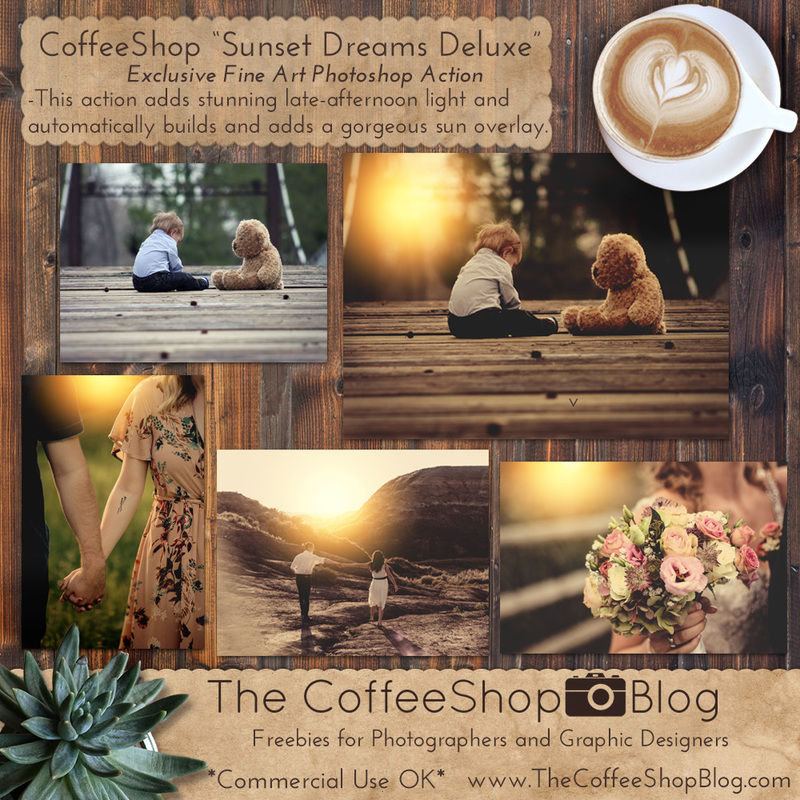 If you haven't checked it out, you can get hundreds of my favorite actions, presets, and digital designs in one download and help support this site if you purchase my CoffeeShop Mega Pack. You can read all about it below. I will also send free updates for up to two years after purchase, just email me when you want my newest pack. Due to the downloadable nature of this product, there are no refunds. All sales are final. Please do not share the download. By purchasing any download packs from this page you agree not to sell or distribute it in any way. Click HERE for my Professional Photographer/Graphic Designer Digital Design Pack. 1. Exclusive Action Sets only found here and not on my blog or anywhere else for free! These sets come with full pdf printable instructions. You can see examples in the images posted below. 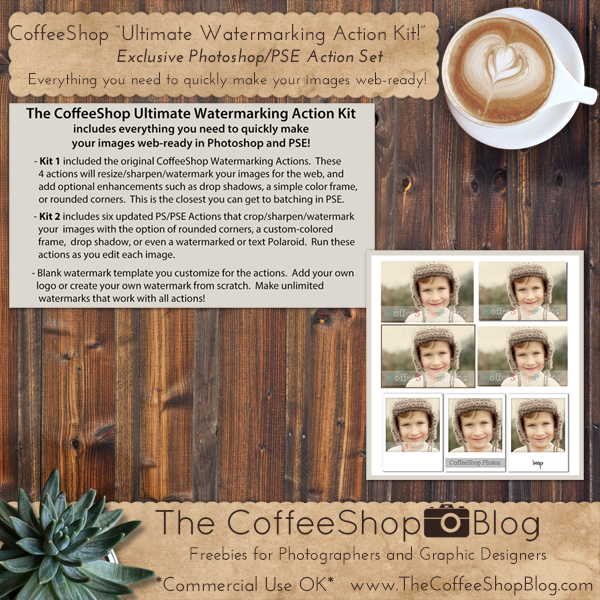 These actions will run in the English language version of Photoshop (CS-CC) and should run in Photoshop Elements (11-2018). - CoffeeShop "Sunset Dreams Deluxe" Action: Automatically builds and adds a gorgeous setting-sun overlay and stunning late-afternoon light to your images. 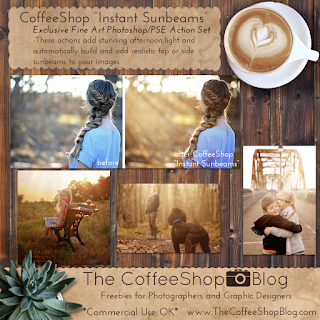 - CoffeeShop "Instant Sunbeams" Action: Automatically builds and adds a top, left, or right realistic sunbeam and stunning afternoon tint to your images. 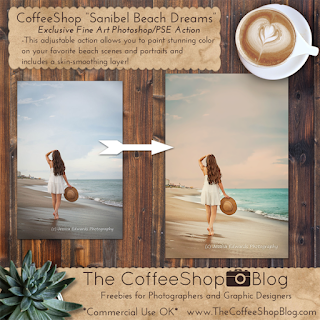 - CoffeeShop "Sanibel Beach Dreams" Action: This gorgeous action allows you to retouch and paint stunning colors on your beach portraits. 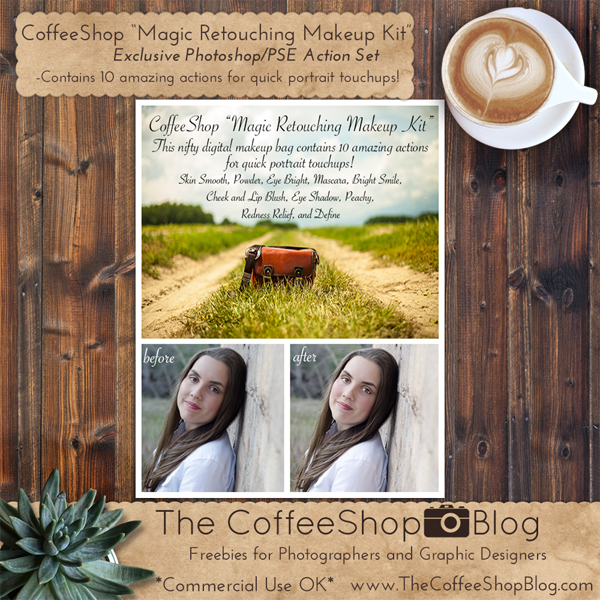 - CoffeeShop "Magic Retouching Set": Includes 10 individual mini retouching actions (skin smooth, powder, eye bright, mascara, bright smile, cheek and lip blush, eye shadow, peachy, redness relief, and define) in one convenient group. 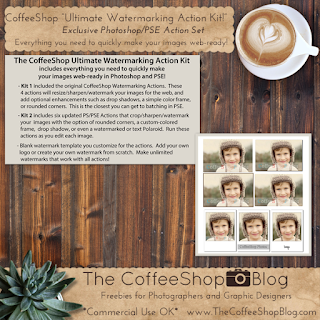 - CoffeeShop "Ultimate Watermarking Action Kit": This kit makes it easy to resize, watermark and add borders, rounded corners, etc. and sharpen your images for the web. This set includes deluxe two kits. Magic Retouching Action Set (exclusive to this download, not found for free on my blog), includes skin smooth, powder, eye bright, mascara, bright smile, cheek and lip blush, eye shadow, peachy, redness relief, and define in one convenient grouped set. 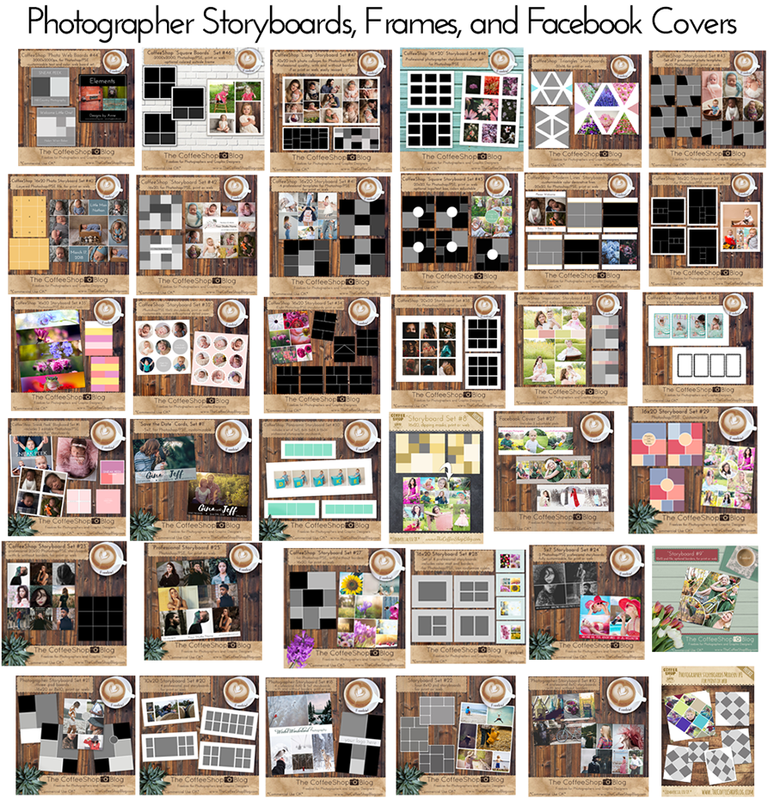 2 Minute Miracle, 2 Minute Miracle Plus, 1V1H Storyboard, 2V Storyboard, 3V Storyboard, 3x4 PhotoMaker Horizontal, 2020, Adjust the Light, Amethyst Luxe, Aphrodite, Aphrodite B&W, Aphrodite Luxe, Aphrodite Posh, Aphrodite Vivid, Art Gallery, Artistic Light Leak, Attic Vintage, Auburn Matte, Auto Blog Board 1, Auto Blog Board 2, Auto BlogBoard 4, AutoH ColorBlock, AutoH2 ColorBlock, AutoV ColorBlock, Auto Paper Frame, Autumn Luxe, Autumn Vintage, Autumn Pop, Baby Blanket Blur, Baby Miracle, Baby Peach, Baby Powder, Baby PowderRoom, Baby PowderRoom 2, BackDrop Fix, Barista No Wait, Barista, Beach Dreams Water & Sky, Beach Dreams Rosy Sky, Before and After Storyboard, Beachy Luxe, Berry Luxe, Blog Diptych, Blissful Light, Blue Cashmere Matte, Blue Velvet Luxe, Bluebell Mist, Blushing Kisses, Bold Pop, Boost, Bright Smile, Burgundy Wine Matte, Burn, ButterCream B&W, ButterCream Velvet B&W, Buttercream Beauty, Buttercream Luxe, Buttercream Vintage, Buttered Toast, Butterscotch Vintage, Butterscotch Vintage Matte, B&W Intensity, Cabernet Afternoon, Caramel Dreams, Caramel Velvet Luxe, Caramel Velvet Luxe Mini, Carnival, Cashmere Rose, Cashmere Rose Mini, Chamomile Tea, Chamomile Tea B&W,Channels, Claret Blush, Classic B&W and BitterSweet Vintage, Classic Storybook "Pollyanna", Classic Storybook "Secret Garden", Classic Storybook "Velveteen Rabbit", Coffee With Cream, ColorBar Deluxe Square, ColorBar Deluxe Horizontal, Color Cast Killer, Color Tints, ColorPop 2, ColorPop 3, Confetti Lights, Creamy Chocolate B&W, Creamy Hazy Light, Creamy Luxe, Creamy Toffee Latte, CrossProcessing, Dandelion Wine, Dark-Eyed Beauty, Dark and Eerie Night, Dark and Stormy Night B&W, Define, Denim, Don't Lose the Freckles, Downtown, Dream Maker, Dreams of Neptune, Duotone Dreams, Enchanted Forest, Enchanted Woods, Enchantment, Enchantment B&W, Enduring Love, Enduring Love BW Tinted B&W, Express Eye Bright, Eye Bright, Fabric Maker, Facebook Cover 4 Photo, Facebook Fix, Faded DayDreams, Fall Frenzy, Fashionista Luxe, Fashionista Luxe Light, Fine Art, Firefly Nights Set, Flaxen Daydreams, Focal Zoom, French Blue Haze, Gentle Dove Gray B&W, Give it Texture, Glacier Ice Lights, Glacier Ice Lights B&W, Glamour Glow, Glitter Maker, Glorious Light, Golden Afternoon, Golden Afternoon Bliss, Golden Bliss, Golden Bokeh Kit, Golden Cashmere, Golden Enchantment, Golden Sun Rays, Golden Vintage, Gossamer Wings B&W, Gossamer Wings-Color, Graphic Art, Grainy B&W, Gray Velvet, Green Tea, Group It, Hazy Afternoon, Heavenly Butterscotch, Heavenly Light, Honey Lush, Honey Luxe Matte, Honey Retro, Honey Retro 2, Hot Cocoa 2, Hot Cocoa, Ice Pop, Indigo Ink, Instant ColorBar, Intensity, Irish Breakfast Tea, Jane Austen's Romance, Layer Mask (for PSE5-PSE8), Light Leak Magic Top, Lilac Frost, Little Perk, Lomo, Lovely B&W, Lovely Blush B&W and Color, Lovely Light, Luminous, Luminous Color Burst, Lustrous Color, Lustrous Pop, Magic Light Overlay Creator, Magic Storyboard Creator 1V,2H, Magic Board 1 8x10, Magic Board 2, 4 Square, Magic Sunset, Magic Texture Pro (PS only! ), Magical Forest Light, Matte B&W, Matte Mocha B&W, Matte Color, Matte Color Vintage, Matte Enchantment, Melancholy Matte, Mellow Yellow Sunlight, Meringue B&W, Merlot Luxe, Merlot Luxe B&W, Misty Lavender, Mocha Velvet B&W, Mood Vintage B&W, Moody Monday, Moody Pop, Moonlit Fairy Dust, Mulberry Luxe, Neptune Blush, No Cream or Sugar B&W, Once Upon a Time, Once Upon A Time-Custom, Orton 2009, Paint With Light, Paint-by-Number, Painted Borders, Peachy Glow, Peachy Matte, Perfect Matte B&W, Perfect Portrait, Perfect Portrait 2, Perfect Portrait 3, Perfect Portrait 3 Express, PhotoStrip, Pink Cashmere, Pink Glow, Pink Velvet Luxe, Pinot Noir Luxe, Polaroid Effect, Posy, Portrait Express, Portrait Luxe, Portrait Give It Texture, Portrait Texture Magic (PS only), Portrait ToolBox 1.0, Portrait ToolBox 2.0, PowderRoom, PowderRoom 2, PowderRoom After Dark, Pretty Makeup, Pretty in Pink, Pure B&W, Rainbow Dream (includes rainbow texture and sun flare brush! ), Rainbow Velvet Luxe, Raspberry Tea, Raspberry Tea 2, Rays of Light, Redness Relief, Retro Warm, Robin Egg Blue, Rose-Colored Glasses, Rosy Lights Effect, Rosy Vintage, Rounded Corners, Rounded Corners 2, Sanibel Beach Dreams, Sapphire Luxe, Save Face, Selective Color, Selective Color Pro, Shabby Chic Rose, Sharpen, Simply Vintage, Smoky Velvet, Snowy Day, Snowy Dreams, Soft Autumn Glow, Soft Dove B&W, Soft Gray Satin, Soft Hazy Blues, Soft Indigo B&W, Soft Lilac Matte B&W, Soft Velvet Matte, Splendor B&W, Spotlight Drama, StarStruck, Storyboard 1V+2S, Storybook Vintage, Summer Wine, Sun Bliss, Sun Kissed, SunKissed 2, Sun-Kissed Butter, Sunny Pop, Sunset Dreams, Sweet Bakery Glazes II, Sweet Bakery Hard Glazes, Sweet Baby Dreams B&W, Sweet Cupid, Sweet Dreams, Sweet Pastel, Sweet Pastel Baby, Sweet Vanilla Custard, Teeny Tiny World (auto and custom), Texture & Frame, Timeworn Treasure, Toasted Coconut B&W, Tree Carving Magic Set, Underwater Luxe, Urban Grit, Vanilla B&W, Vanilla Latte, Velvet Ash B&W, Velvet Berry Cake, Velvet Cream, Velvet Mocha Matte, Velvet Peach, Velvet Truffle, Vignette, Violet Dreams, Vintage Bliss, Vintage Blue Luxe, Vintage Blush, Vintage Honey, Vintage News, Vintage, Vintagram, Vintagram 2, Vivid 3, Vivid 2, Vivid No Wait, Wallets 2 (with and without frames), Web ColorBlock It, Web Diptych2, Web Drop Shadow, Web Frame It, Web Round It, Web Rounded Corners, Web Painted Corners, Web Simple Frame, Web Storyboard 1, Web Storyboard 5 pics, Web Triptych, WebBoards Rounded Corners 1, Warm Cider, Warm Beauty, White Chocolate, Winter Dreams, Winter Dreams Extreme (includes snow texture! ), Winter Wonderland, Winter Portrait Luxe. Click here to see all of the Photoshop/PSE Actions and Lightroom Presets included in this Mega Download Pack. 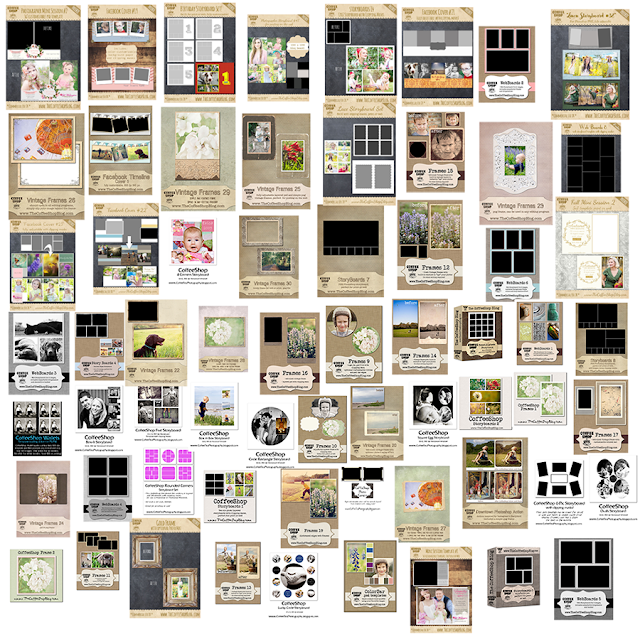 And you can see examples of what is included in the design pack below. Many of the design elements are layered .psd files, so you must have Photoshop or Photoshop Elements to use them. I have also included many .png and .jpg files that can be opened in most editing programs (such as the digital papers). Most of these designs will not work in Lightroom. 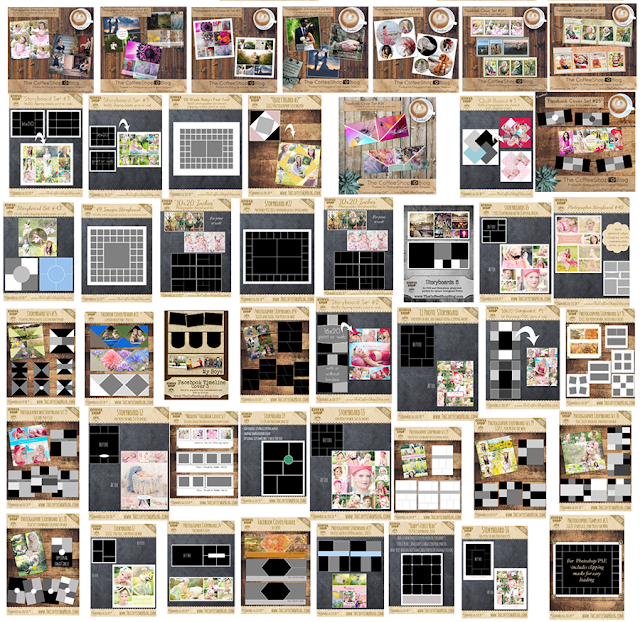 Unfortunately I can not provide one-on-one support on downloading, loading, or using these design elements on your computer and instructions are not included in the download, but I have full instructions posted here and I do have many detailed tutorials posted on my blog. 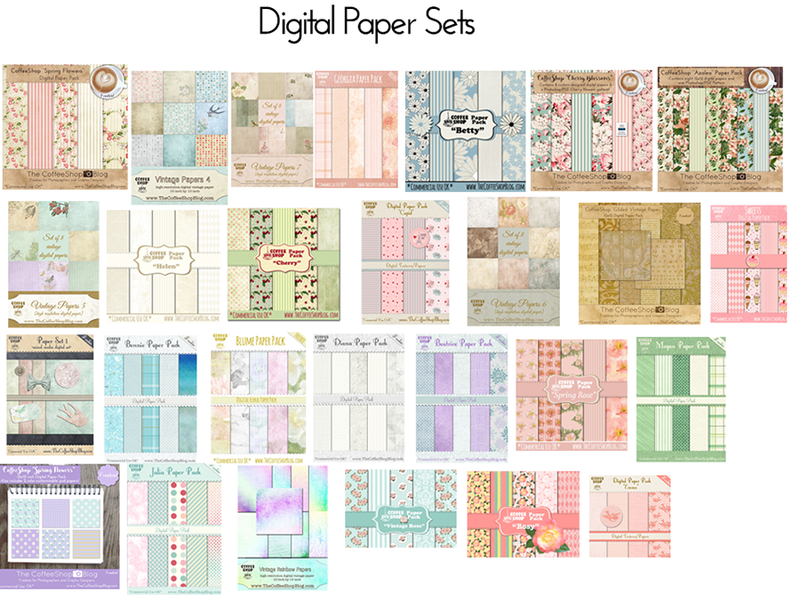 If you are new to using digital designs, papers, scrapbooking designs, etc. you might want to download a few free ones on my blog first! Due to the downloadable nature of this product, there are no refunds. All sales are final. Please do not share the download. By purchasing any download packs from this page you agree not to sell or distribute it in any way. Please save a copy of the download somewhere safe in case your computer crashes. Once the 1 year from purchase free update time has expired you must repurchase the pack if you want a new download link. NOTE: You will be directed to the instant download site once you make your purchase and you will also receive an email with an additional download link. The zipped file is quite large (over 500 MB) so it might take some time to download if your internet is slow. For help: Click here. And thank you so much for making it possible for me to continue to create for The CoffeeShop Blog!